You might not know this but Johannesburg is the largest landlocked city in the entire world. Sure there are bigger cities, but they are either coastal or built on a lake or river – so we’re saluting Joburg for now. While Johannesburg may not be the “largest man-made forest in the world” it can still claim to be the “largest man-made urban forest” with more than 10 million trees. 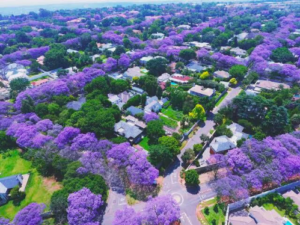 Not only do trees reduce carbon emissions, they considerably improve Johannesburg’s residents quality of life. On satellite pictures, the city looks like a rain forest, albeit man-made. There are 1.2 million trees within the parks and on the pavements, and 4.8 million in private gardens throughout the suburbs. Since 2006, there has been a massive effort to extend this forest into Soweto through the Soweto Greening Project, which began that year with 6000 trees being planted. By 2010, there were more than 200 000 trees planted in Soweto. Tree planting took a huge leap forward when gold was discovered in 1886. The early mining companies developed a nursery at the Horticultural Training Centre at Zoo Lake, where experiments were conducted to test which trees were suitable for mine props. This resulted in blue gums being planted in areas with water like Saxonwold, Parktown, Langlaagte, Craighall and Fairlands. 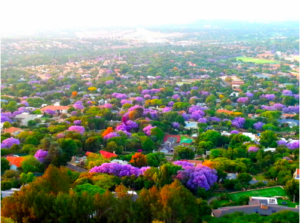 But it’s the Jacaranda that has become synonymous with Joburg. 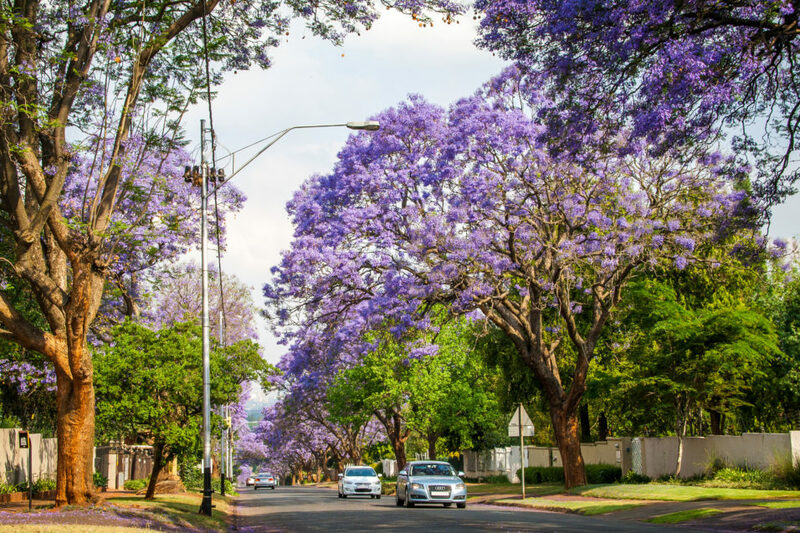 While Pretoria may be unofficially known as the Jacaranda City with more than 70,000 trees lining its streets, it is Johannesburg that actually has more Jacaranda trees, with the first tree planted at Charlton Terrace in Doornfontein back in the early forties. 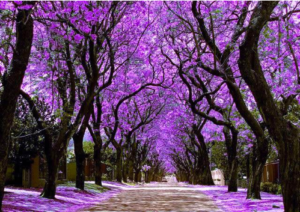 The word ‘Jacaranda’ is believed to mean ‘fragrant’ in a native South American dialect, and the trees are known for their gorgeous purple blossoms. Having said this, some species boast beautiful white petals, although they’re much more rare in South Africa. These white wonders can be found in Herbert Baker street in Groenkloof, Pretoria. Johannesburg residents don’t just benefit from the aesthetic beauty of our “man-made forest”. Nature is so mentally restorative that it gives our minds a rest from the forced, direct attention that modern life and urban environments increasingly call for. It also relieves mental fatigue, and can bring down cortisol levels in walkers, which means less stress. One large tree can absorb 150kg of carbon dioxide a year, as well as filter some of the airborne pollutants, including fine particulates…helping us to breathe and ultimately live better, healthier lives.